Enter the sufganiya. Many of my ice cream recipes pay homage to my childhood, but this one, ah this golden, cinnamon sugar coated bundle of goodness, reminds me so much of Hanukkah that I get giddy like a little school girl just thinking about it. Maybe if I tap my heels together three times some presents will show up at my door! Wishful thinking. This time of year, when all I do is eat sweets, I try to refrain from thinking about how unhealthy it is and instead think about the significance of these doughnuts. On Hanukkah we eat these golden delicious sufganiyot because they are fried in oil, which helps to remind us of one of the miracles of Hanukkah. While the mixture is warming, whisk together three egg yolks. Pour the milk mixture into the egg yolks very slowly, stirring between each pour. Scrape the bottom of the bowl to make sure you get all the vanilla bean paste, and pour back into the saucepan. Heat until the mixture reaches 170 degrees F. If you don’t have a thermometer heat until the mixture is thick enough to coat the back of a spatula or a wooden spoon. Once ready, pour over a fine mesh strainer into a clean bowl (it’s important to strain this ice cream because inevitably small little curdles will form from heating the egg and milk, and trust me, you don’t want those in your ice cream!). Once strained, slowly stir in the remaining cup of half-and-half and the vanilla extract. 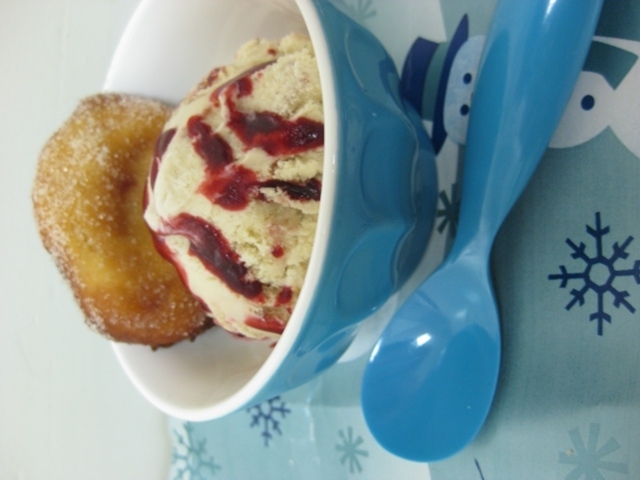 While the ice cream mixture is cooling, and the sufganiyot are rising, make the raspberry sauce. Pour the bag of frozen raspberries into a small saucepan, and mix until heated. The raspberries will turn to mush (which is what you want). Stir in the sugar and vodka and let the mixture heat for 2-4 minutes. Remove from the heat, and strain through a fine mesh strainer. Discard the seeds, and keep the smooth raspberry sauce. Set aside. The Verdict: Taim me’od! (very tasty!) This is a perfect treat for the holiday season. In fact, so tasty that I recommend sharing it with friends (like I did) or else you may gobble the whole thing up! Enjoy this fun take on an old classic and Happy Hanukkah!